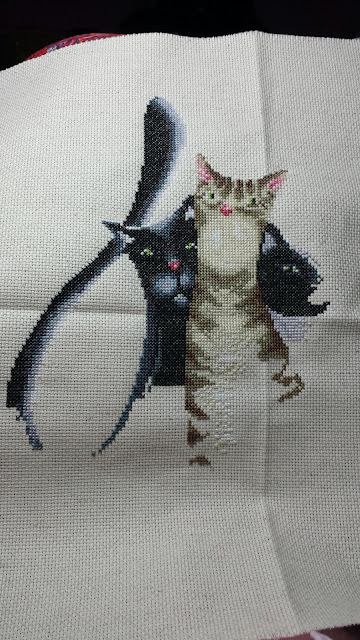 My new cross-stitch project, Kitty Trio. Aren't they cute? Then there's my cute kitty. And as I was very good but between catching up and Herrschners having a 20% off code (plus 10% from joining their savings club recently), I treated myself to some downloadable patterns. The last two have fabric requirements for cross stitch or needlepoint. One thing that I seemed to have mentioned on my blog at all are my two afghan orders from Herrschners. I bought half last month. The sports pillows and the cat are no longer available on their website. And two are knit. I figure it's a good way to force myself to actually learn. I bought a set of needles a while ago. They're still in the box. And I was good with ABCstitch's 20% off sale. Stuck with the clearance page with minimal damage. And I've made up for my huge deficit last month. 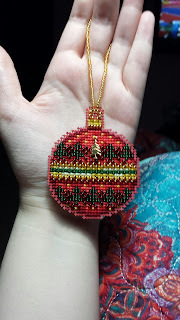 Almost everything I bought from the Christmas in July sale is finished. One thing that I seemed to have mentioned on my blog at all are my two afghan orders from Herrschners. The last is in the mail as I write this post, thus the download only splurge.